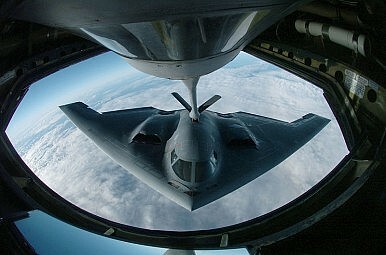 America’s B-2 Spirit bombers participate in Foal Eagle training exercise. Signal to North Korea? For all of North Korea’s recent threatening statements over the past few weeks (or months, or years—depending on your timeline), one things is for certain, there is nothing like action to set the tone. “Demonstrating the commitment of the United States and its capability to defend the Republic of Korea and to provide extended deterrence to our allies in the Asia-Pacific region, U.S. Strategic Command sent two B-2 Spirit bombers for a long-duration, round-trip training mission from Whiteman Air Force Base, Mo., to the Republic of Korea March 28 as part of the ongoing bilateral Foal Eagle training exercise. What was more interesting – at the bottom of the statement’s Korean language version was a factsheet detailing all the capabilities of the B-2. Maybe just some background information for us eager journalists? A signal to North Korea? When one also takes into account recent drills involving the B-52 bomber, the United States is clearly trying to send a signal. Unlike like the weaker North Korea that is heavily reliant on bellicose rhetoric, the U.S. is capable of merely showing off its powerful military prowess to remind the North Koreans of America's powerful arsenal. Note to Pyongyang, it might be time to cool the rhetoric just a wee bit.